The 4K/UHD HDR standards are in place, and Apple TV 4K honors the most important ones. But there are a few wrinkles to be aware of. 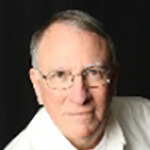 I’ll summarize and point to several awesome resources. HDR/Dolby Vision on left. Plain 4K (SDR) on right. …display technologies and HDR technologies are well-fleshed out. There is no new ‘thing’ on the immediate horizon that we should be waiting for. Or be concerned about in terms of making our new equipment obsolete. Nevertheless, in an industry like this, there are always players who, for some reason, buck established technologogies for their own reasons. For example, Samsung is holding out on Dolby Vision because there’s a certain amount of loss of control over the display. But Sony has come to embrace Dolby Vision along with LG, TCL and Vizio. The Apple TV 4K in its current state supports HDR10, Dolby Vision and HLG. This was a wise selection. However, when buying a TV, it’s good to know which TVs support which HDR standards and also where the industry is headed. This is a very good place to start because author Geutskens lays out the marketplace prospects for each of the technologies. Especially valuable is the chart at the end of the article that shows (with tabs) which TV brands, media players, Hollywood studios and content distributors support which HDR format. This is pure gold. Amongst the gems is a low-key reminder that the 4K Roku box does not yet support Dolby Vision while the Apple TV 4K does. 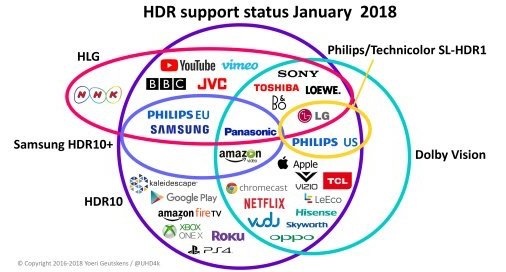 Then, after CES, author Geutskens provided another gem in the form of a Venn diagram that summarizes HDR support and provides additional perspectives on where each technology stands. That’s in light of studio and TV brand politics and some technical considerations. See: “HDR video format support, post-CES 2018.” More gold here. Just about everything there is to know about 4K/UHD HDR is in these two articles. They’re the best writing I’ve seen on this topic. One of the reasons 4K/UHD Blu-ray players haven’t taken off is because, prior to CES 2018, no company had a 4K player that supported Dolby Vision. That’s now changed with the introduction of Sony and Panasonic models. More are sure to follow. All of them were to require a software update (following later) to enable Dolby Vision. For Oppo, this came in June. LG issued an update in August but reportedly had to retract it and still hasn’t delivered a final update. I’m not sure the Philips was ever released to market. I’ve seen another model on Amazon but never this model. Why would one invest in 4K/UHD/HDR/Dolby Vision discs when there’s growing content available to stream from Amazon, iTunes, Netflix and Vudu? Purists will point out that 1) The customer may not have the 25 Mbps into the house required via the internet and 2) There will be some level of compression via streaming that is avoided when one has a physical disc. As I recall, 4K/UHD content leaps off that plastic disc at 60 to 100 Mbps. The above articles have a wealth of information about the state of 4K/UHD and HDR from several different perspectives: the TV makers, the set-top=box makers, the studios and the content deliverers. And even while the discussion and accompanying charts can seem complex, the good news is that the industry has so far avoided a debilitating format war that would vex consumers and slow down sales. 2018 will be a great year for 4K/UHD. Yoeri mentioned that to me as well. After I confer with him, and using your info as well, I’ll edit the article. Thanks. WRONG – Oppo 203/205 supported Dolby vision in June 2017 with a firmware update.